The 2 day event held in Rome is co-organised by the European Organization for International Research Information (euroCRIS) and the Institute for Research on Population and Social Policies of the National Research Council (CNR-IRPPS) and is focused on Managing Data Intensive Science - the role of the Research Information Systems in realising the Digital Agenda. With the opening keynote by Dr. Carl-Christian Buhr, (Member of the Cabinet of Ms Neelie Kroes, Vice-President for Digital Agenda, European Commission, Digital Agenda) Infrastructures for Open, Digital Science, CRIS 2014 is the twelfth edition of the biennial series of conferences on Current Research Information Systems (CRIS) organised since 2002 by euroCRIS, a professional association of CRIS experts and custodian of the Common European Research Information Format CERIF. 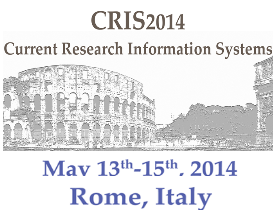 The purpose of CRIS 2014 is to discuss recent trends in the management, availability, quality and use of research information in the context of e-Science bringing together researchers, managers of research-performing or funding institutions, evaluators, librarians, ICT experts and policy makers. CRIS Systems do increasingly lie at the core of the information infrastructure for all organisations involved with research: where it is performed, funded, assessed. The growing emphasis on enhancing transparency of research, maximising the impact and knowledge transfer, improving dissemination of research results – covering publications, but also datasets and software – requires joint efforts for the achievement of a common vision on the research lifecycle, for the development of integrated information systems as well as for efficient policies that support e-Science infrastructure. Both the demand for and the supply of research information are high, yet the available resources are often not interoperable. As a result, information about research on the institutional, regional and European level is highly fragmented.